"I was called to be counsel of he who was my master during the time that this function was sought after by everyone. I owe him the same service now that so many men find it dangerous". Letter to the Convention, dated 11th December 1792, in which the 72 year-old Lamoignon de Malesherbes volunteers to defend Louis XVI at his trial. I should, nevertheless, consider it a calumny on the nation if I did not openly recommend to my son MM. De Chamilly and Hue, whose genuine attachment for me led them to imprison themselves with me in this sad abode". Last Testament of Louis XVI, written in the Temple prison, dated 25 December 1792. On both sides of the ideological divide, the Revolutionary era is full of examples of outstanding personal courage and self-sacrifice. One such was given by Claude-Christophe Lorimier de Chamilly, loyal premier valet de chambre to the doomed Louis XVI. We have already met Lorimier de Chamilly in happier times, for it was he who in 1756 married the fabulously wealthy Marie-Thérèse Marsollier, daughter of the "Duchess of Velvet". The match consolidated the movement of the Marsollier family into the noblesse de robe and the world of royal finance. Chamilly's office as intendant et contrôleur des écuries et livrées du roi brought with it a luxurious apartment in the Rue Saint-Honoré where his father-in-law, René Marsollier, was able to spend the final years of his life in comfortable retirement. Claude-Christophe and his wife produced two children, a son, Claude-René, born in 1759 and a daughter Adelaide Marie Octavie, born in 1762, later marquise de Pernon. Madame herself died in 1782 or 1784, before her fiftieth birthday. In 1764 Claude-Christophe assumed his father's position as one of four premier valet de chambre to Louis XV. This was not a humble domestic servant's post but a pivotal office within the royal household, commanding the substantial charge of 200,000 livres. Although the duties were mainly honorary, the valets were near the King for most of the day and involved in his most private affairs. Under Louis XV they influenced the King's choice of mistresses and acted as intermediaries in the conduct of his secret foreign policy. Holding a huge candelabra, they later escorted the less sexually adventurous Louis XVI to the Queen's bedroom on nocturnal visits. Thierry de Ville d'Avray, a favourite of Louis XVI, was the intermediary through whom the Girondins made their last approach to the King in July 1792. In 1774 Claude-René, who had been a cavalry officer for two years, was allowed to take up his hereditary tenure ("la survivance") of the office of premier valet and henceforth carried out the functions in conjunction with his father. 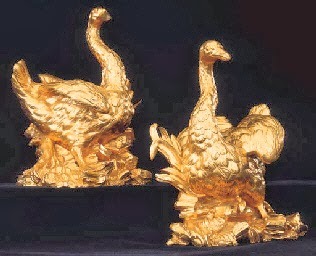 Un feu orné de cuivre doré d'or moulu représentant deux cygnes 900 francs was listed in Madame Lorimier de Chamilly's appartement. 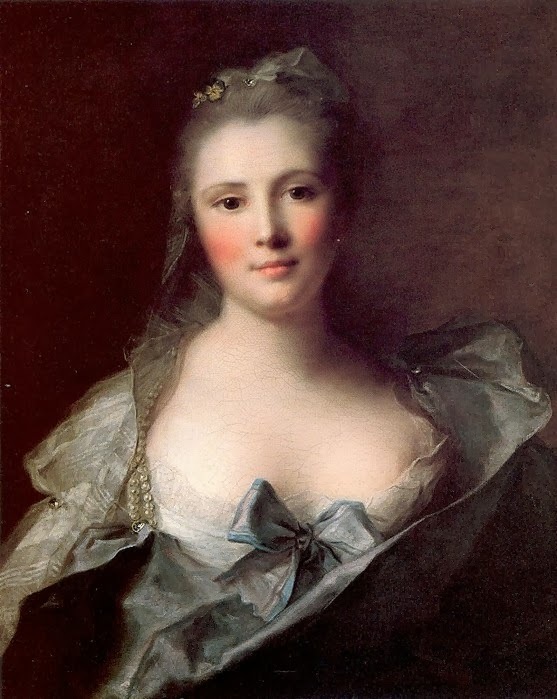 Madame Lorimier de Chamilly had been one of the marquise's ladies-in-waiting and it is more than likely that she either received the chenets as a keepsake or purchased them in a sale following the marquise's death. 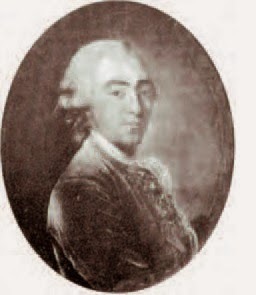 Claude-Christophe Lorimier de Chamilly, son of Antoine Charles Lorimier, intendant et contrôleur des écuries et livrées du roi and related to the Pernon family, married in 1756 Mlle. Marsollier, who brought a dowry in excess of 170,000 livres. He assumed his father's position and became premier valet de chambre to Louis XV in 1764. Lodged by the King in the Grande Ecurie, he lived in the rue Montblanc (now Chaussée d'Antin) in Paris and these chenets were placed in his fashionably decorated salon: un feu orné de cuivre doré d'or moulu représentant deux cygnes 900 francs." In 1782 Claude-Christophe bought this magnificent château and its domain in the Marne for his son Claude-René, who now assumed the title of comte d’Étoges. Their tenure was to be shortlived. In the Revolution the climate in Étoges was highly charged from the outset, due not only to the position of the comte at Versailles but to the radicalism of its mayor Étienne Lambert, le berger d'Étoges, who was a friend of Saint-Just. On 20 June 1791 at one o'clock in the afternoon the royal coach on its way to Varenne reached the staging post in the village but the king remained hidden inside; "At Étoges, we feared we would be recognised," wrote princess Marie-Thérèse. July 1792 saw the final act of a seigneur of Étoges, when Claude-René presided over the traditional coronation of the rosière, a virtuous maiden of the manor. Lormier de Chamilly, father and son, were arrested shortly afterwards and the château ultimately sequestered and sold. The valets de chambre are a constant, scarcely perceived, presence at the side of the king throughout the Revolutionary period. The Chamillys, father and son, are mentioned particularly in conjunction with the journée des poignards - "the day of the daggers" - on 28th February 1791, a curious episode in which assorted nobles and royalists - possibly as many as 500 - were invited into the Tuileries on pretext of a ticketed reception and endeavoured to make good a royal escape from Paris whilst Lafayette and the National Guard were diverted to Vincennes. Louis, with his loyal valets in support, was ultimately forced to co-operate humiliatingly with the Revolutionary authorities in disarming these unruly sympathisers, many of whom were armed with no more than a stiletto dagger. Print from the Bibl. Nationale. 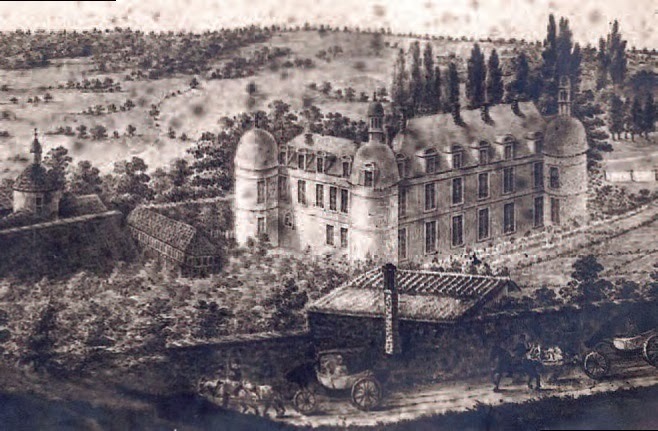 On 10 August 1792, at some personal risk, the father and son fought their way to the royal party and remained with them for the three days whilst they took refuge in the former Feuillant convent. On the evening of 13 August, after painful negotiations, Claude-Christophe was one of a handful of faithful retainers - the princesse de Lamballe, the Tourzels, mother and daughter, Mesdames Thibault, Saint Brice and Navarre, his fellow valet Hüe - who were allowed to accompany the royal family to their final imprisonment in the Temple. Hüe records that the two valets lend their master linen and exchanged silent looks over the uncurtained and verminous bedstead in which he was to sleep. On 19th it was announced that the attendants were to be removed for interrogation by order of the Commune; at midnight the two men had just thrown themselves on their shared mattress when the Commissioners finally arrived to take them by carriage to the Hôtel de Ville. Only Hüe was allowed to return. Chamilly was transferred to La Force prison, where, like others in the royal entourage, he narrowly escaped massacre. Madame de Tourzel has left a circumstantial account of her "acquittal" and her hurried rescue from the prison, but for Claude-Christophe there is no detailed information. We learn only that "the people" liberated him on the 2nd September and (somewhat curiously) escorted him home in triumph. After the death of Louis XVI, the father and son remained free, but they were arrested on 9th February 1794 at the instigation of the Revolutionary committee of the section des Piques. Claude-Christophe was incarcerated in the Luxembourg prison and condemned to death by the Revolutionary Tribunal on 23rd June 1794 - as one source remarks, a month and four days before the fall of Robespierre. "Claude-Christophe LORIMIER DE CHAMILLY, "ex-noble et valet de chambre of the late tyrant", was accused of forbidden correspondance. Found at his home, a note without date, concerning the counter-Revolutionary projects of Coblentz and a letter which proved his relations outside France". According to Hüe he was also suspected, unlikely though it was, of having composed Louis's will. Claude-René was more fortunate. Held in the Prison de la Bourbe (the former abbey of Port-Royal) he was released after 9th Thermidor. He lived quietly in France until the Restoration when he assumed his hereditary position as premier valet du chambre in the household of Louis XVIII. He was later made a chevalier de Saint-Louis. He died in 1827. Sale of two ormolu swans, Christie's New York, 2nd November 2000 http://www.christies.com/lotfinder/lot/a-pair-of-royal-louis-xv-ormolu-1896118-details.aspx?intObjectID=1896118. Étoges: Histoire des propriétaires du château.